Milaydy and a few more kids that we had the privilege of spending time with the past few days. In less than an hour Milaydy will be going into surgery. Pleas keep this prescious little girl and her family in your prayers. Yesterday David and I headed for Huehuetenango. Ever since I met the little girl Mileydy about a month ago I have not been able to get her off my mind. She is 18 months old and is hydrocephalic. Her parents do not have enough money to even take her to a doctor and her head is growing rapidly. She spends at least half of her time screaming and crying from the intense pain. 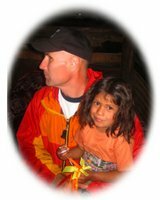 I had considered trying to get her into the national hospital but after my unsuccessful attempts with a few other children in the past month or so I knew that she would probably die by the time they could operate on her.Thankfully Pastor Mike lined me up with Dr. Giovonti who lives in Huehuetenango. Although Dr. Giovonti is not a neurosurgeon he has a lot of connections and a hart the size of Guatemala. Last week Dr. Giovonti did a lot of leg work and today we were able to get all of the necessary tests done and get her admired into a private hospital in Xyla. By tomorrow night she should be in surgery and will receive a shunt that will relive the pressure in her head. Thanks to Dr. Giovonti and many of his associates this is being done at a fraction of the price. It looks like it is still going to cost us around $2500 but what little girl's life isn't worth that. I would like to be able to say that after the surgery Milaydy will be up and running around and be completely normal but the catscan that she had today showed that that will not be the case. Mileydey's brain is extremely small so she will be very limited in what she can ever do, but her family and the rest of us that know this prescious little girl will be happy to see her happy and comfortable and no longer be in constant pain. Please pray for the health of these two teens. Alex who is 19 is extremely frail, and one of Blanka's legs is infected and feaverish. Both legs were close to being amputated a few weeks ago and if the antibiotics that the doctor sent with me today do not clear up the infection that may still happen. 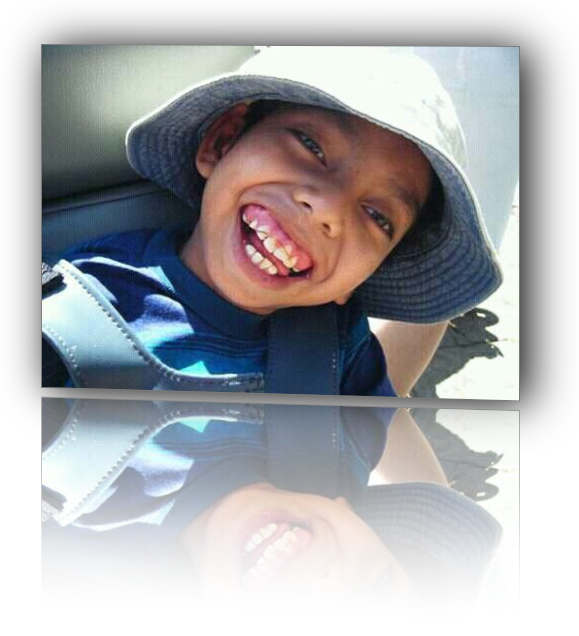 I received word today that Freddy, a boy that we have been working with for many years died a few days ago. For the past few months I have been taking Dr. Giovonti in to see him on a fairly regular bases because a few months ago Freddy started having sever stomach pain. Doctor Giovonti and I have tried our best to convince Freddy's family to allow us to get him into a hospital so that they could run some tests to see exactly what the problem was but they refused. This made it impossible for Dr. Giovonti to know exactly what to do for Freddy. Guess we will never know weather or not anything could have been done for him. I do know though that he was suffering a lot and that now he is with Jesus. I do know though that I have seen a lot of kids die this year alone and that I will truely miss each one of them. Spending the past 7 days in Belize doing wheelchair distribution with the crew from Saint Paul Lutheran Church in Texas has been a busy but very rewarding time. This group realized that giving out and seating wheelchairs was important but the also knew that sharing the love of Jesus through their love and actions was far more important. We all had to be very flexible when we realized that most of those that were called in to receive wheelchairs had absolutely no way to get to the distribution site. All of the available vans and pickup trucks were kept busy either bringing the wheelchair recipients to us or us to them. We headed for home this morning and even though we are now back in Guatemala we still are a day's drive from home. After two days on the road we are finally in Punta Gorda Belize. Even though I was a passenger instead of the driver the seven of us are all exhausted. What should have been a six-hour drive from The Hope Haven shop 2 Rio Dulce yesterday turned into a 10-hour Drive do do a lot of accidents and detours. Nice thing was when we woke up this morning in Rio Dulce we were only 36 miles as the crow flies to our destination. The bad thing was we did not have a crow to fly us there so we had to drive. Would you believe 12 hours and 380 miles later we are here. Please pray for us as we have 5 days the wheelchair distributions starting in about 7 hours. We know that God can do all things and we are really counting on that because we are all really tired. Please remember to lift us and those that come in for wheelchairs up in your prayers. Goodnight. Yesterday was the final day of a 3 day wheelchair distribution with the ROC wheelchair team. Although HopeHaven has done far bigger distributions this one was a great one. Not only did each child receive a custom fitted wheelchair that was professionally fired to meet his or her speific need but this team took the time to love on these families by talking with them, singing to them, playing with them and praying with them. Thanks Roc team and Hope Haven for sharing the love of Jesus with these families. Today was the first of a 3 day wheelchair distribution at the HopeHaven factory with the Rock Wheelchair team from Montana. 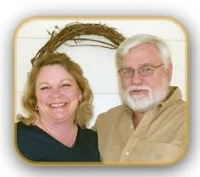 They have a number of highly skilled therapists and seating specialists on their team. A fun bunch to work with. I am not at Liberty to go into much detail right now but today a young lady who visited my home with one of my boys just two weeks ago was murdered. Please pray for this girls family. Pray also for my boy and for his daughter who now has no mother. A few days ago Calin and I gave Milady a new Kid Kart wheelchair that my friends at Vine International had given me a while back. Both Milady and her mom who looks like a child herself love the wheelchair. When I shared with Milady's mom that we can grow the wheelchair (make it larger) as her daughter grows Mon had a hard time holding back the tears. She shared with us that Milady's heand is getting larger by the day due to the fact that she is hydrocephalic. Mom knows that a shunt needs to be put in but she has no money for a shunt or for the urgently needed surgery. My friend Eric gave me some money and told me to use it wisely. (Guess that meant no more beds that would be used as a chicken pen.) I am planning on purchasing a shunt with that money. We are praying that the national hospital in xlla will preform the surgery for free since we are providing the shunt. Hopefully we will have an answer from them in a few days. Time is of the essence so that any further brain damage can be prevented. Please keep this little girl and her young mother in your prayers. This is a perfect example of some of the misconceptions some of us well-meaning Americans seem to make. I for one felt that two beds were not enough for a family of five. Some American friends of mine felt the same way so about a year ago we brought the family some new beds. When I return to their home today I found that they were back to two beds in one small room. They told me that they feel more comfortable that way. I must say though that they put one of the new beds to good use. We can only hope that the chickens can not squeeze through the bars. Some more neat people that we visited today. Yesterd my friend Eric, Pat and I went to the poorest area of Guatemala City to visit a young man that had been parolized from the waist down in a gang fight seven years ago. 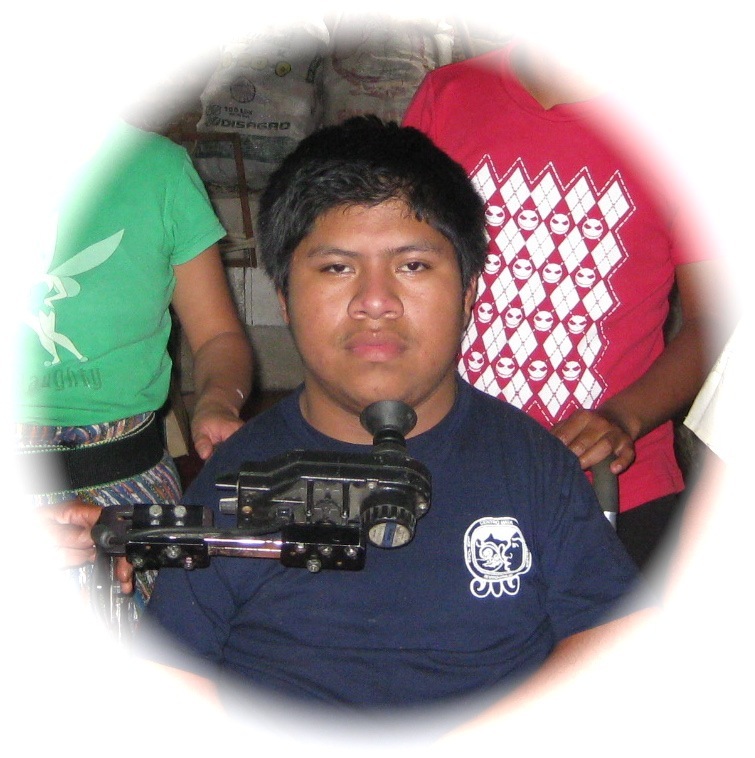 Even though he is confined to a non functioning power wheelchair on the third floor of a house that is in the center of the most gang infested part of Guatemala Angle has a radiance about him that tells you that he has an inner peace that most able bodied people would envey. His body is covered with gang tattoos that tell you that he has lived a rough past but God has changed Angles hart. When Angle's power chair did run his family would carry it and him down the two narrow flights of stairs so that he could go out and share with his old friends about how Jesus had changed his life. While we were there yesterday I got his power chair running and promised to bring him a new manual wheelchair so that he can use the manual wheelchair up States where he spends most of his time helping his father make shoes. The power chair will stay on the first floor so that Angle will once again be able to go out and share the fact that he sincerely feels that his disability is ment for God's glory. I realize that some of you who are reading this may not be Christ followers and may believe that Angel's strong faith is nothing but a crutch, but believe me what Angle has is the real thing. If you don't believe me, contact me and I will take you along with me the next time I visit this amazing man of God. Today Calin, Esbin and I drove to Santa Rosa to repair Miguel's power wheelchair. We soon had it up and running. The only problem is Miguel can not go to school. Not because of the locked gate in the picture. It is unlocked during school hours. The problem is the set of steps at the gate and another set by the class rooms. Thanks to some of my face book friends in an earlier post that I did a few weeks ago, today we were able to order all of the material and hire a man to not only pot in two wheelchair ramps at Miguel's school but we also had money enough left widen and pave the muddy path that leads from Miguel's house to the road that leads to his school. Guess I have to fess up and admit that Facebook is not a complete waste of time. Thanks to a fantastic team the past few days have been a good bit of work that all seems like play. It was my pleasure to be part of this today. Finally back home after 5 days in HueHuetenango. 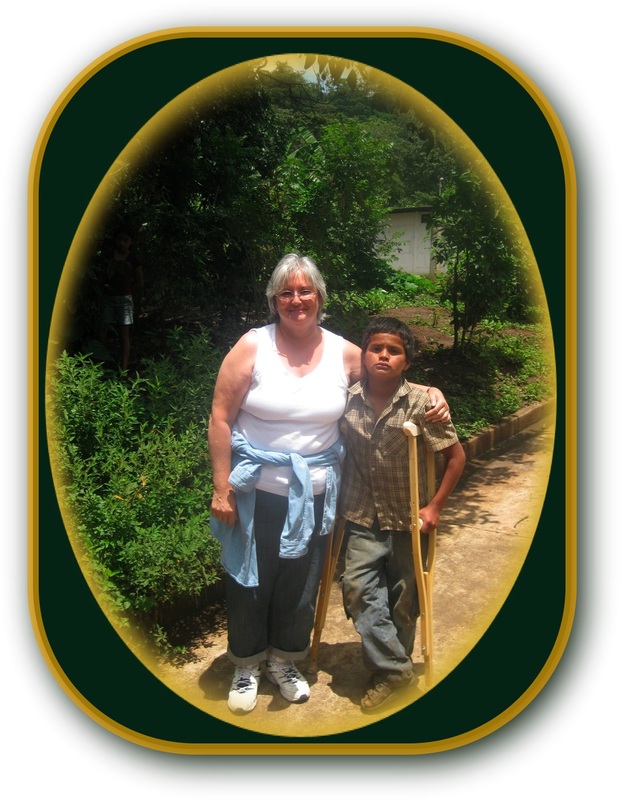 Before leaving we took Juan a man that we gave a chair to on Sunday into HueHuetenango get some x-rays. Juan had his leg broken when he was hit by a car over a year-and-a-half ago. He went into the National Hospital but they told him since they were out of money he would have to pay for the surgery and for any pins or plates that would be needed to fix his leg. National hospitals are government run and are supposed to help the people free of charge. However this hospital told him he would have to pay several thousand dollars if he wanted his leg fixed. Juan will likely not see that much money in his entire life. When he told the National Hospital that there was no way that he could pay that much they discharge him and send him home with a broken leg that was never set. Today's x-ra confirmed what I thought. The tibula is broken and the bones have slipped past each other causing Juan constant pain. 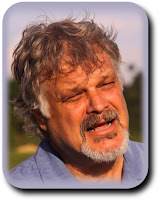 I am now in contact with my friend dr. William who lives near San Lucas Telemann. We are praying that when he has a medical team in next February that they can operate on Juan's leg and have him walking again. know if they wanted to join them for supper. I must say this is the first invite that I ever had to a Mother's Day celebration but I quickly accepted the invitation and we all had a great time. Tomorrow night I promise the kids that I would take them all out for pizza. So we are not going hungry here in Guatemala. Well it's about time for bed so I will say goodnight. Kevin and I ended up staying another day in HueHuetenango. Thanks to Doctor Giovonti we got Freddy in to see a specialist. He is still in a lot of pain but things do not seem to be life threatening. We already lost one little boy this week. That is already one to many. Praise God we are finally finding some good doctors in this area. We were scheduled to see this little boy this morning, but I just got word that he died. Another fantastic day in HueHuetenango. Rudy received his new leg. Three people received new wheelchairs and I felt like a proud papa watching my boys share the love of Jesus in their actions and their words. Reminder to self. Next time I ask myself why we drive six hours to refit a prosthesis or to fix a wheelchair, simply look at the pictures. Alex and I have been working on power chairs in Pana and all around the lake for the past two days. We were supposed to be home by tonight so that I could get ready for a trip that I am making to HueHuetenango on Friday., but we ran out of daylight and out of energy so we are spending the night in San Pablo. Tomorrow we plan on making two more stops and then hopefully making it home by early afternoon. I know it's a bit of a crazy schedule but if we did not do this several of these kids would not be attending school. Some of them have already missed a couple of weeks of school because of non-functioning power chairs. Is it worth all the work and all the effort? Take a look at some of these pictures and then you be the judge. It has been another roller coaster day. When we got to national hospital in Guatemala City we were told that only Balanks and her mother could go inside. Her father, Calin and sat outside of the hospital for over 7 hours getting only occasional tell iPhone reports from Blanka's mom. It took some time but the Antigua hospital finally got her medical files to the Guatemala national hospital. More tests were run and at 3 PM we received word that Balanka was being prept for surgery. This is unheard of in the National Hospitals in Guatemala since the waiting list even for emergency surgery is usually several months, Especially considering that last night's newspaper said that the national hospital was going to do no more surgery until further notice because they were out of almost any medications. Roughly a half hour after being told that Balanka was being prept for surgery mom came out of the hospital with Blanka's. The surgen had decided that he wanted to put her on antibiotics for a week and then make a final desision. Blanka's and her family are now in a hotel here in Chimaltenango. Tomorrow I will be driving the family back to their home near the coast. Please continue to pray for this family and for me. I know that it is in God's hands but it has been an emotional rollercoaster for all of us. Yesterday I got a phone call from Blanka's father. 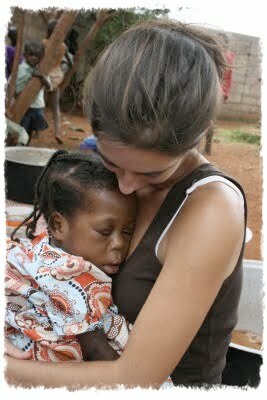 She is the girl near La Gomera who has the condition that resembles leprosy. A doctor at the national hospital near Antigua has convinced the family to have both of her legs amputated. I wanted to stop things until we checked into it better but it sounded like the operation was already in progress. This morning Blanka's father called me again saying that at the last minute the doctors decided to run a few more tests before operating on her. He told me that if I got to the hospital right away the surgen would hold off on the surgery until he talked with me. Due to past experiences that I and others that I know have had with the national hospitals in Guatemala I headed right down to the hospital with my friend Mario to interpret. hospitals but the doctor and staff that are working with Blanka's are excellent and really doing a lot of testing. I am convenced that the operation is necessary to save her life but the doctors are hesitant because of her poor circulation and smaller than normal hart. Tomorrow we will move her to Rosivelt wrere more tests can be done. I will keep you posted on the outcome. Perhaps I will have to retract my words. Last night while Blanka's parents were resting in a room that I rented for them. (The night before they slept no the floor of the emergency waiting room.) One of the doctors discharged Blanca, telling her that she would have to go to the national hospital in the city. Bassicly he turned her out on the street. No paper work and no instructions other than to get herself in to the hospital in the city. Fortunately her mom returned to the hospital to check on her or she would have spent the night alone outside of the hospital. Since the battery of their phone was dead I was not contacted until 6 this morning. We are now at Rosivelt National hospital in the city trying to see if anyone knows what is going on. Please pray. 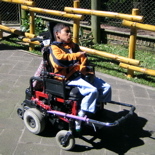 On Friday Juan Carlos Curruchich and I drove to Barberania and replaced the batteries of Miguel's Power Bee wheelchair. With out it he was unable to go to school. Problem solved? Not quite. Now his school is telling his parents that they have to supply a cement ramp if they want their son to continue his schooling. Problem is the family does not have money for something like this. Thank you Vine International for these wheelchairs that we were able to give to these two people today. Mario and I were also able to visit several families that I have know for many years. We are now in Guatemala and about 2 hours from home. Even though the wheelchairs arrived 2 days late this fantistec crew of 8 Guatemalans and one not so fantastic Gringo managed, with the help of our El Salvador friends to give out around 140 wheelchairs. Several of the children were very severe and we virtually had to build the seating system around them. The little boy in the picture was one of my most difficult cases. It took me 4 hours to get his Hope Haven Honey Bee wheelchair exactly the way I wanted it. His mother's tears and hugs made my whole week worth it. 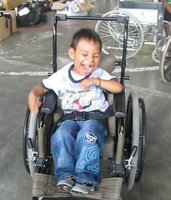 Today was our second day of fitting and giving out wheelchairs here in El Salvador. Since the chairs were held at customs for several days we were not able to have distributions on Monday or Tuesday. We are now working long days to try to get as many wheelchairs given out and professionally fited as possible. Some of the villages have actually rented busses to get there people to us for wheelchairs.Some of the Hope Haven workers have to get back home before Saturday but we plan to give out more wheelchairs in the morning and then hightail it for home. I wish to thank all of you who prayed that the wheelchairs would be released today. usually when you get a red light at customs it means they have to unload the whole container or truck and often times the chairs sit in storage for several weeks. it's a real Miracle but tonight we have the wheelchairs. Tomorrow we plan on fitting and giving out about 70 of them to adults and children who desperately need the them Thursday we plan on doing the same and on Friday morning about 25 more. There will still be between 70 and 100 wheelchairs left to do but we will store them here and come back and do them at a later time. Our two friends from the Walk About Foundation in England had to fly back across the pond today, but we still have five Hope Haven Guatemala employees, a number of Friends from the organization here in El Salvador, Alex and Yours Truly (the one and only Gringo) here to do the distribution. Please don't tell me that prayer doesn't work. We arrived here in Queiche Sunday evening. 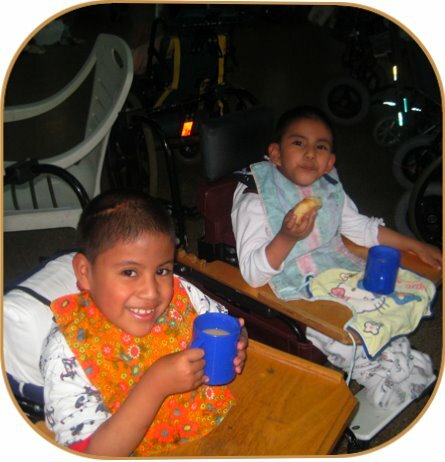 By Wednesday evening over 150 adults and children will be enjoying their new custom fitted wheelchairs. LIOÑEL passed away this morning. I am on a borrowed phone because mine just broke. I got a phone call this morning telling me that Lionel has passed away. I am out of town and since I have no phone or computer I do not have much other information. I know that he is now in a better place but it is still hard. We have lost far to many kids at Hermano Pedro this past year. I loved them all bit Líonel holds a special place in my hart. I am still at a lack of words for how Lionel has affected my life. God has given me a love for all of the kids at Hermano Pedro but Lionel had a way of making my roughest days good ones he knew how to help me put my whole world in perspective and gave me wise conceal without ever uttering a word. I am happy that you now have a new body with no pain, but I miss you my friend. Virginia Scot has a way of describing Lionel that describes how so many of us felt about him. Just got back from a three day Hope Haven wheelchair distribution with a few workers from Hope Haven Guatemala and occupational therapy students from Missouri University. What a great bunch of university students to work with. We stayed and worked at a special needs school near Chiquimula. The students there were some of the happiest kids that I have ever met. At a Hope Haven wheelchair distribution this past week. The boys wanted to go to the beach this weekend. This is why I said no. Almost as bad as Antigua. I spent most of this week with Pat and the team that she had visiting her from the States. Everything from feeding centers, to village visits to taking the young men from her group home to the park. Why I don't post selfies. Glad I had 10 to choose from. The others were not as flattering. And No I do not do drugs or alcohol. The house filled up quickly after returning home from being on the road for 8 days. Rudy and his father ended up going with me to San Lucas toliman where Rudy got successful surgery. The drive to my home and then to the lake took nearly the whole day. The fact that Rudy vomited at least once every two minutes did not add to the enjoyment of the ride. I am happy to say though that Rudy is doing well and within about two weeks we should be able to have him fitted with a new prosthetic leg. I am still up in HueHuetenango and have not slept at my home in 8 days. Pat was with me in San Lucas Tellimon where Rudy had his surgery but stayed there to interpret for the American doctors. Calin is there interpreting as well. David and Luanne have once again joined me and we are still up in HueHue visiting with families. The needs here are overwhelming. Just yesterday we stopped off at the home of Freddy a little boy who have been sponsoring for several years. Freddy is 15 years old but barely the size of a 4 year old. We could tell when we got to his place that he was in a lot of pain. mama told us that he had been like this for several weeks now. We have had a lot of problems in the past finding the doctors in HueHue but thanks to a series of what I could only call Godincidences we went overnight from not having a clue as to what we could do to meeting a wonderful Christian doctor who not only went with us to see Rudy but spent the entire day with us getting lab tests and medicine for Freddy. Freddy is a very sick boy he has an infection and should be hospitalized but his parents refuse to have input into the hospital. We did manage to find all of the medicine that dr. Giovanni wants him to have and we even found someone in his remote location who can give him daily injections. Doctor Giovanni will be checking in on him as well. Please pray for Freddy. Pray also that if he does not start to get better soon that his parents will allow us to get him into a hospital. I know that I promise to write more about Rudy the boy who needed the bone shortened on his amputated leg. it ended up that the family finally agreed to go with me to san lucas telemark to get the needed surgery as long of Maria Garcia came along as interpreter. Soon David, his wife LouAnn, maria garcia, rudy, father and I were on our way. the normal 5-hour Drive to my town took a little longer than expected due to all the vomiting that Rudy did. I don't think that this poor kid has ever been in a car before. When we got to chimaltenango david and when, bus to antigua. I think they had encountered all of the vomiting that they can handle for one day.knowing that I would be gone from home for another 5 or 6 days I quickly packed up a suitcase and loaded the car with wheelchairs and food four people in Hue hue. So proud of Juan Carlos. The medical teem that is in San Lucas Tellimon was short on translators so I gave Calin a call. Today he is interpreting for the doctors. For those of you who have been asking about Rudy who I talked about yesterday. Rudy is the first of 25 patients that will receive surgery this week. I will write more about him when I find the time. Please keep the medical teem and the patients in your prayers. Everyone always says be flexible if you­­ plan to do Mission work in Guatemala. L­ast Friday that proved to be very true­. ­David his wife Luanne and myself head­ed ­out on a three-hour Cruise (Drive) t­o de­liver food to a family near the coa­st. Ab­out an hour from their home I rec­eived a phone call from Ma­ria Garcia a ­lady that I've known for year­s who live­s up north Huehuetenango. She tol­d me t­he family of Rudy, looked like they­ wer­e backing out of their plans to meet­ me­ in Chimaltenango the following day. ­ I­ have been trying to get surgery for R­u­dy for over year and a half and up unt­i­l now it looked like it was going to fin­aly wo­rk out. A surgical team that is p­ut tog­ether by my good friend Dr. Willi­am was ­going to be here for a week pref­orming l­eg and foot surgery. About 6 ye­ars ago w­e manageed to get Rudy who is ­missing his ­left leg a prosthesis and e­ven though he­ has outgrown 3 of them th­ey have change­ed his life. The only pro­blem is about a year­ and a half ago the­ fibula started to grow and is trying t­­o push its way through the skin at the s­tump of his leg and Rudy can no longer w­here a prostetic leg. The family knows the importance of thi­s operation but they are afraid. Most o­f them have never been out on their smal­l village, they know no Spanish and the6­ are afarid of outsiders. Most of them ­have family members who not that many ye­ars ago were slaughtered by either the g­orillaa or the military. Also many stil­l believe that foreigners are only there­ to kidnap or kill their children and se­ll their body parts. I had a feeling though that if I went­ up and personaly talked to this family ­that I have known for years that might c­hange their minds and allow Rudy to have­ the surgery. One problem though. It was Thursday ­and we were a good 7 hours from Rudy's h­ome. Even if Rudy and his family did ag­ree to come along with me I would have t­o make the 5 hour drive to my home to pi­ck up some clothing and to drop off Davi­d and Luan and then drive another 3 hour­s to San Lucas Telliman where the surger­y was to take place. After 8 days on the road it is good to be back home. I really enjoyed the training that we did and the wheelchair distributions but my favorite part was being on the road with three adults who were every bit as mature as I am. Yesterday I mentioned that I was going to give an extremely difficult to fit young man into a wheelchair today and that I would,appreciate your prayers. I just wanted to say thanks to your prayer it was a sucess. After nearly 4 hours and carving 4 layers of foam this 19 year old is sitting up for the first time in his life. His sister who appears to be in her early twenties absolute adores him. She told me that he is her life. Could most of us say that about someone that we had to feed, change, bathe and do every thing else for? Especially considering that they could not even say thank you. This young lady will never make the news, but she is my idea of a true hero. We got done with fitting our last wheelchair recipient at a little before 5 this afternoon. We thought that the last 2 days were going to be use training about 20 Honduras people how to fit 50 speciality wheelchairs but we were wrong. The 4 of us did have a few helpers but we really wished that those that came the first 2days could have received more training. We had another great day of doing training and seating kids in their new Hope Haven wheelchairs today. I am in Honduras with these three. It was a long drive but we made it safely. During the next several days we plan on teaching local socal workers and others from various towns and villages how to properly seat and maintain standard and specialty wheelchairs. This will be done in class room and hands on experience. On Tuesday through Thursday we will be giving out and fitting wheelchairs to adults and children. It is our hope that the Honduras people that we train will soon be able to do distributions like this on their own. I am learning more an more how important it is to teach someone how to fish. We must remember though that it is hard to fish on an empty stomach. That is why it is sometimes necessary to provide the fish for a short time. My boys have put together a soccer team. They won the first game that they played so we celebrated by having lunch at Camperos. I am so proud of my boys. A few days ago Marcose, Esvin and Elder told me about a mother and her four children who were living in poverty. My boys asked if we could bring them with solar system so that they would at least have lights at night. I have been extremely busy lately but my boys kept urging me to go and see this family so today after taking a few of the orphanage kids out to lunch my boys and I went to visit this family. The oldest son who is around 16 years old has quit school and tries to pick up odd jobs so that his family occasionally has food on the table. Mom is so skinny that it looks like the first good wind would blow her away. Tonight the family finally has lighting in their home. Tomorrow we plan on bringing them food and vitamins. We will also fruther share with them more about the love of Jesus. 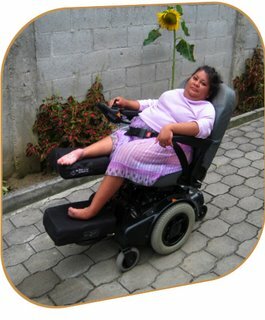 Today, after fitting a few more wheelchairs, we said goodbye to our Nicaraguan friends. It is now up to them to give out and fit the remaining wheelchairs in their towns and villages. With the enthusiasm and love that they demonstrated this week we are confidant that the children that they serve are In good hands. We had another great day today. 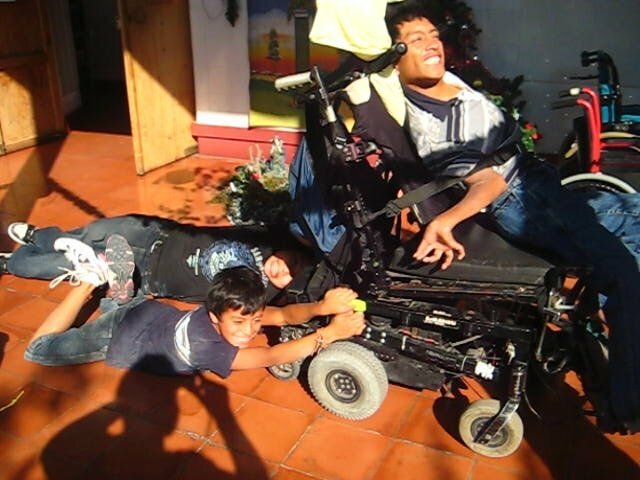 We did more wheelchair training with the Nicaraguans. They are catching on fast and most of them know that it goes a lot further than just seating someone in a wheelchair. We pray that they as well as the families that are receiving the wheelchairs can see the love of Jesus in what we are doing. "IT'S NOT ABOUT THE WHEELS." We are spending 4 days in Managua Nicaragua teaching a number of doctors, therapists, and social workers how to seat disabled children into speciality wheelchairs. Most of the people that we are teaching are from small towns and villages outside of Managua and are planning on taking some wheelchairs and what they have learned back home with them. We are giving both class room and practical instruction. Yesterday was mostly class time and today we had 11 kids come in to receive wheelchairs. Our students are fast learners and love what they are learning. We are confident that they will soon be able to go into their villages and seat wheelchairs that Hope Haven sends them without our assistance. Are we worried about working ourselves out of a job? Not for a second. The needs in all of these Central American Countries is overwhelming. 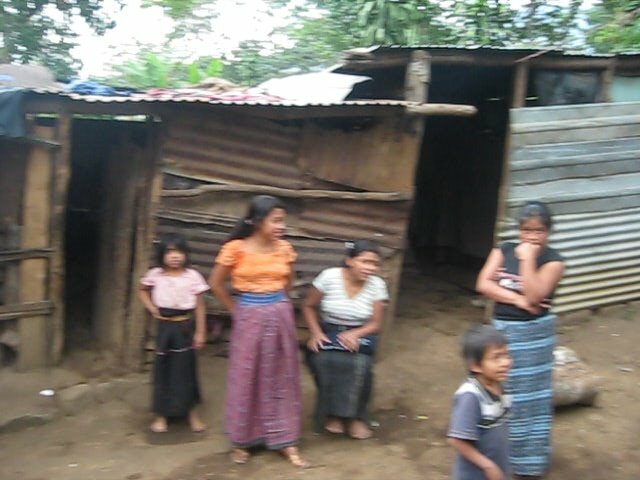 It is exciting to see Guatemalans that we have helped train go out to other countries and train people there how to help others. Sort of a big snow ball effect. I do feel privileged to be here but also happy to know that the 3 people with me could do it on their own. Makes one wonder if missionaries are actually suppose to work themselves out of a job? Thank you Jesus for a great day and a great bunch of people to work with. Lots of driving, in the past 2 days we have been in 4 different countries. We are finally in Nicaragua. We panned on being in Managua but it took longer than expected getting across the border crossing betwene Honduras and Nicaragua. So we will drive the remaining 2 hours tomorrow, but for now goodnight. 8 Months ago while in Elselvador we made a promise to 20 year old Jose that we we would get him his very first wheelchair. Today while driving to Nicaragua we were able to deliver that wheelchair to Jose. Both Jose and his father nearly broke into tears because Jose will no longer have to spend the next 20 years in his bed. We had a great day at Hope Haven Guatemala today. 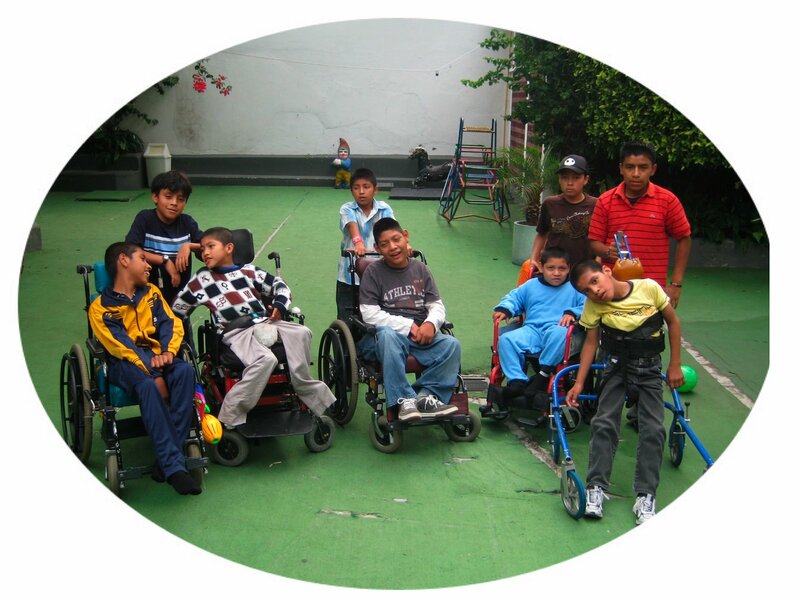 A lot of children got their very first wheelchair. My friend pastor Hector was able to speak and pray with each family individually. Thanks to Calin and Cesar and the employees of Hope Haven many hands made for lite work.